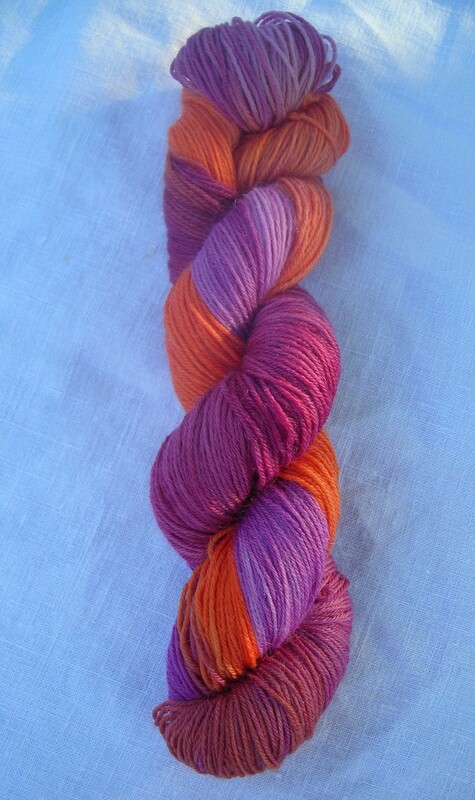 But it's actually the fact that I couldn't find any orange and purple sock yarn. Anywhere. Ever. In the universe. At least not one that could be posted to me without it being stopped at customs and questioned by officials. 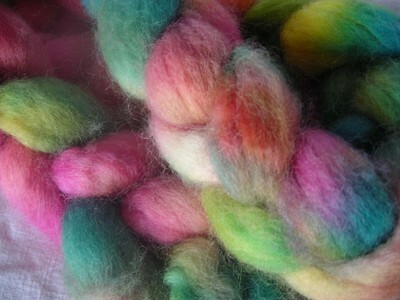 So I dyed this skein. And it knits up like this. 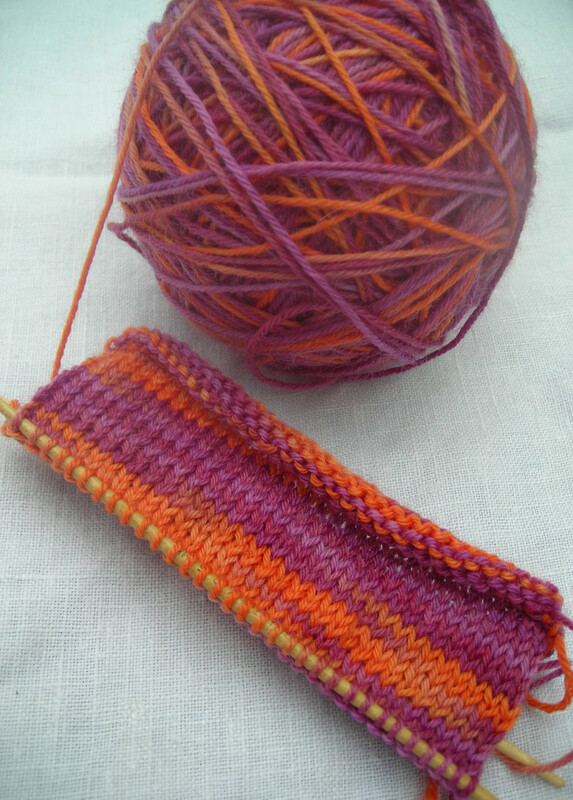 I love orange and purple together. Although knitting this as a passenger in the car yesterday did make me feel sick. I like to think that it was knitting in a car per se, not the colours that did it. *sigh*. The beginning of a beautiful friendship. Sock, meet book. Book, this is sock. You look like a great couple. (have I read this? have I heck as like. Sorry Mr Lawrence, it's not your writing. Shamefully, I bought it for the cover. Hands up who hasn't done that? Book as desirable object in itself regardless of writing contained therein, discuss and hand in your essays later. 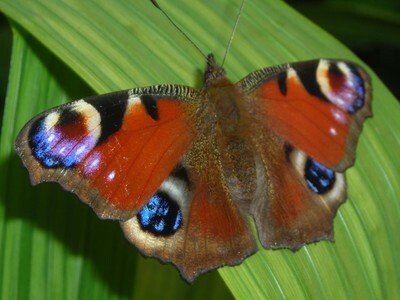 I'll be setting a test on Tuesday.) 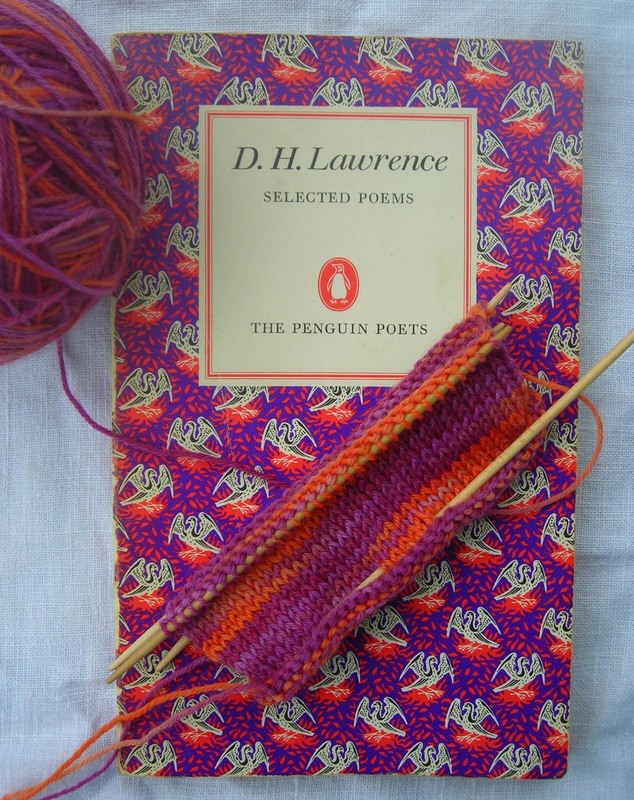 This could be the start of a whole new website full of socks that match my dusty old books...imagine the possibilities...The Richard and Judy Sock Club. Socks and Lovers. Lady Chatterley's Socks. Miss Pettisock lives for her Endpapers! Note to self: introduce Iron to Tablecloth before taking next batch of pictures. And hide books as far away from socks as possible. Frankenyarn! This is the yarn I spun in yesterday's post knitted up into a swatch. Which, as you can see, has a life of its own. 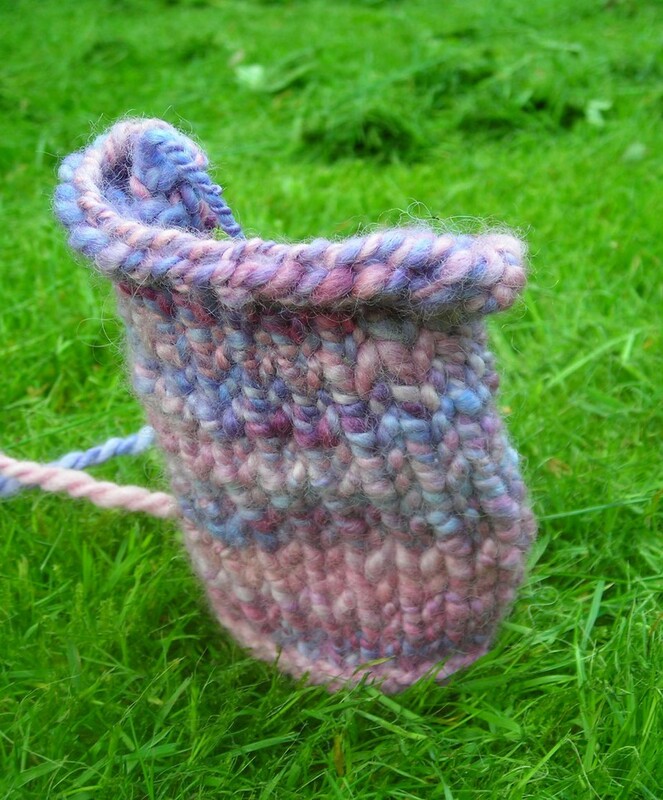 Knit with this and all your garments will be alive, I tell you, alive! This swatch walked off the needles and into the garden all by itself where I found it sobbing quietly and muttering 'I didn't ask you to create me'. Good lord, what have I done? I know what the problem is. I plied it too tightly. A "beginner's mistake", apparently. Pah! Anyway, here's my attempt at plying more loosely, or Navajo plying. I daren't even knit that up for fear of creating a sibling for the Living Swatch. 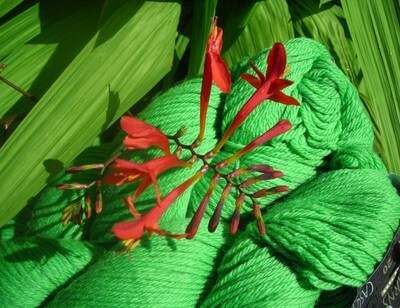 Not shown in picture above: the bit where beautiful yarn gets covered in mud after dropping off the leaves. Yarn: Cascade 220 in shade 7814. Mud, model's own. Model: Montebretia at Percy Thrower models. Which more than makes up for the Frankenswatch, don't you think? That's what the Yarn gods are saying to me today as they wag their fingers at me and my sad pair of deflated, shrunken, felted, £9.99-and-two-weeks-of-knitting socks. Told you so. 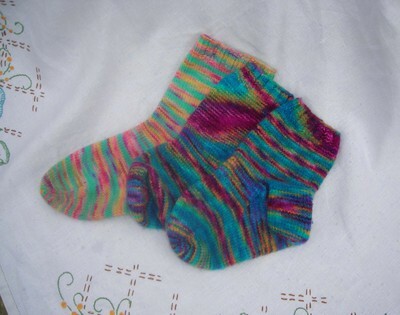 There's a normal, healthy sock in the same yarn right behind them, for comparison. Big sock Good, tiny felted sockettes, Bad. The yarn gods had it in for me the moment I pledged never to hand-wash my knitted socks. It went well to begin with: a carefully selected 30 degree wash and a pillowcase, and I was laughing when they came out OK. "Bwahahahah! Stuff you, handwash only yarn!" I cried in a final act of hubris. Well, next time to wash them came along, and I forgot the pillowcase. And then I wasn't concentrating and after getting them out of the washer they were bundled with the rest of the washing, straight into the - gasp -TUMBLE DRIER. Anyone have any ideas what to do with them now? Answers on a felted postcard. Spinning. 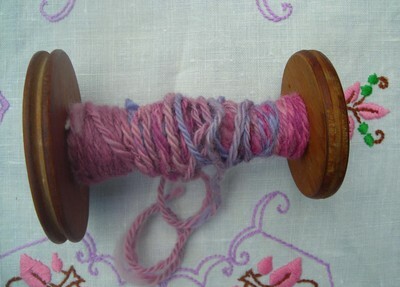 Here's my attempt to stab the fabled yarn gods in the eye with some spinning! 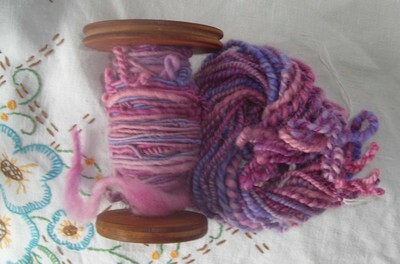 There's my first go at spinning roving, there on the bobbin, and the yarn plied against itself is on the right. I've only had the wheel since Sunday, and after a lot of swearing and persistence I finally came up with that little lot. I don't think you'd want to knit anything with it. Perhaps a tea cosy. Something where you won't be bothered by the weird bobbles and bits of dried grass that somehow worked their way in there. I tell you, dried grass yarn, it's the future, I've seen it!